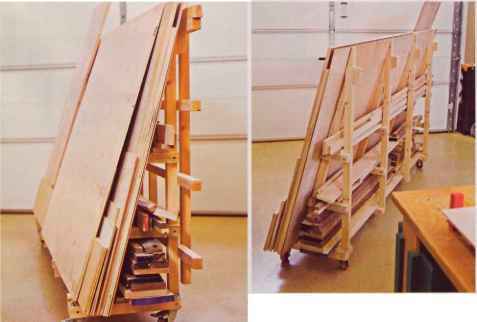 Instead of building their portable sheet-goods rack with two sloping sides, as most plans call for, Wayne and David made one side perpendicular to the floor so they could store the rack flush against the wall. The straight back also makes a good place to hang the plywood-cutting frame shown on page 81. Shelves of varying widths hold longer boards. Photographs: Bert Vanderveen, Vanderveen Photography woodworker's profile ayne Southard has been inlo woodworking only for about eighi years, but he's learned quickiy. "I've graduated from the basics and into ihe advanced electives," he jokes. For example, he's paying close attention to the little tricks that help work get done more efficiently. "The biggest thing I learned," Wayne says, "is that when you're cutting out pieces, make sure you label them so you know what they are. That might sound very elementary in retrospect, but you'd be amazed how long it takes you to realize it's a little thing that makes a big difference." 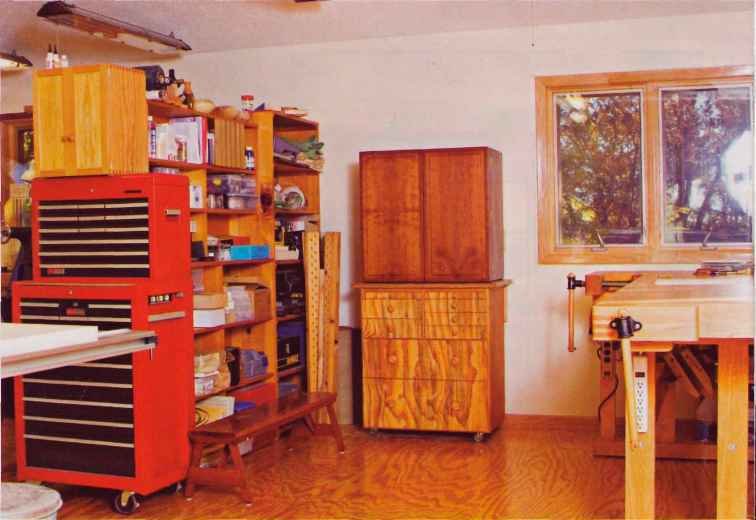 Once Wayne and his son, David, got their shop up and running on David's property, father and son pumped out the shop wall cabinets, sheet-goods rack, and clamp racks. Then, Wayne began work on an entertainment center while David started on the computer desk at right. 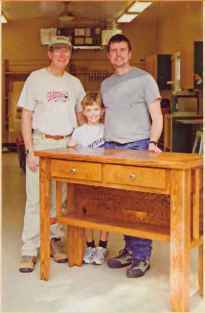 Grandsons Brandon, 9, and Tyler, 13, helped sand the shop wall cabinets—their first experience with power tools. '"They like learning about woodworking from Grandpa," Wayne says, proudly. 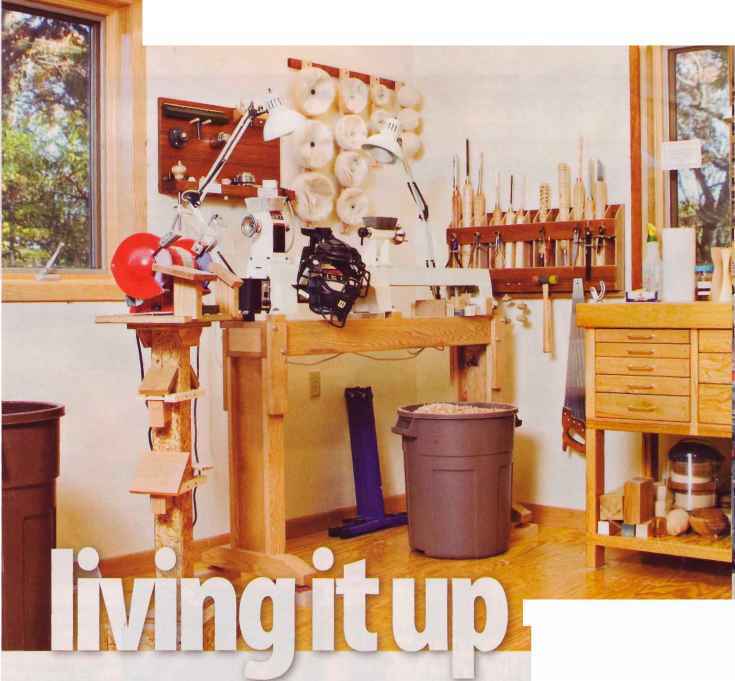 Brian Hahn's shop in wooded Wisconsin has all the comforts of home. And why not? For a while, it was his home! 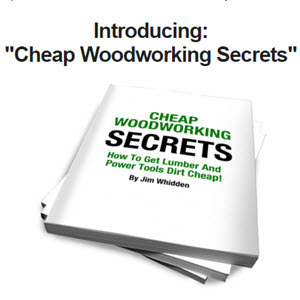 Some woodworkers spend so much lime in their shops, they joke that they live in them. Brian Hahn actually did—for five months while his home in Avoca. Wisconsin, was being built. That's why he added a finished plywood floor, % bath, eating area, sofa bed, and so much more. Oh, he works in the shop too. 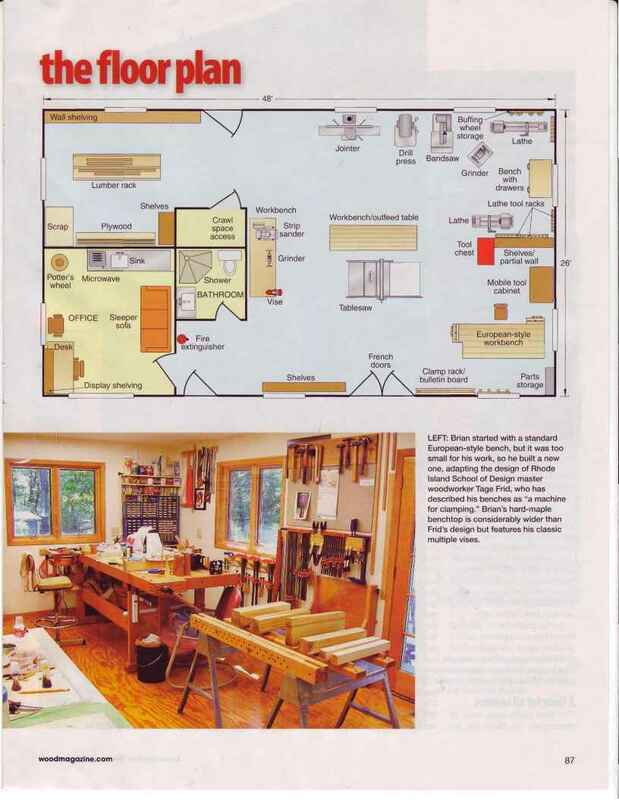 That's where the retired chemist, 59, turns and carves eclectic bowls and lamps, and produces furniture from wood he harvests from his 73 acres of mostly forested property about 60 miles west of Madison. "I built the shop to be inhabitable," Brian says. "It's my office—I come out to work for eight hours, and then I go home. Also, 1 live out in the country, and if there's a fire, they can't get to you real quick," he quipped. "So if something happens to one building, the other is a fallback." ABOVE: Brian nailed the layout of his shop in the first attempt, although he had to compromise on the plan he originally wanted. (See floor plan, opposite.) 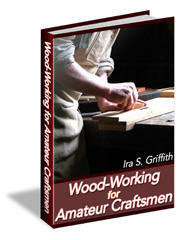 "Experts will tell you to arrange the lumber rack, then the tablesaw, and then the jointer for good work progression. 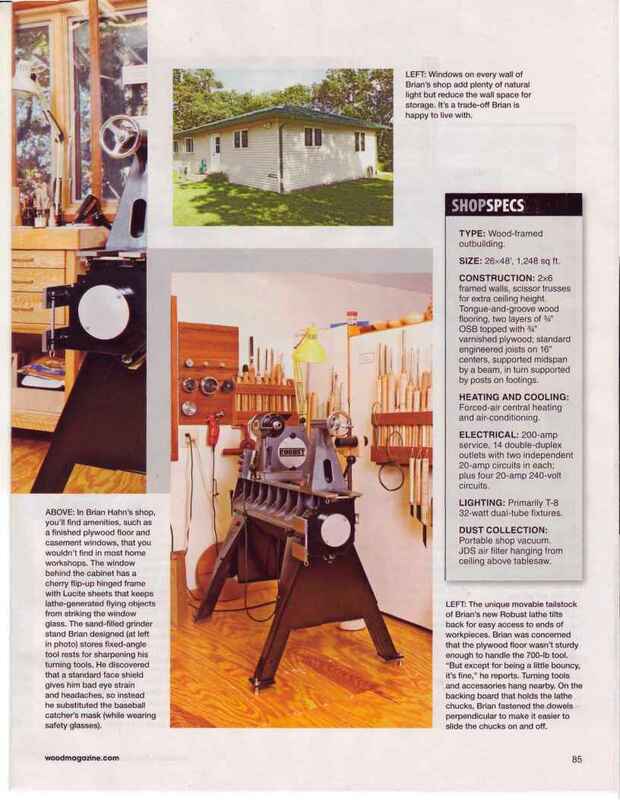 Instead of tackling that at the onset, I positioned the drill press first because it wasn't mobile, and I wanted it where it wouldn't be in the way when I was doing other things," he says. began building the shop first, then started work on the house two months later. From May through September of 1999, Brian lived in the shop, which he says was almost as large as his old house. Brian intended the shop to be a home away from home from the beginning. The 26x48' building is constructed with 2x6 framing. Scissor trusses allowed for a 10' cathedral ceiling, which gives Brian plenty of clearance and afforded him headroom to hang an air cleaner. (Brian didn't install a dust-collection system. but a portable shop vacuum suffices.) Drywall covers the 2x6 framing. One corner of the building became an office, with a sleeper sofa, deep sink, and a microwave. He got rid of the refrigerator he used when he took up residence in the shop. 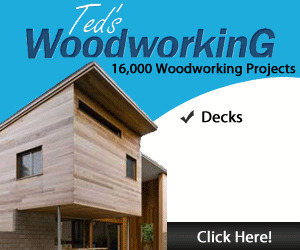 Contributing to the hominess are French doors, which Brian installed in front of his tablesaw. They do add practicality, he insists. "I can just open the doors and run boards in and out," Brian says. "Also, it contributes to ventilation." Casement windows overlook Brian's acreage, which contributes most of the wood he uses for turning. He stores the wood in an area on the other side of the office. 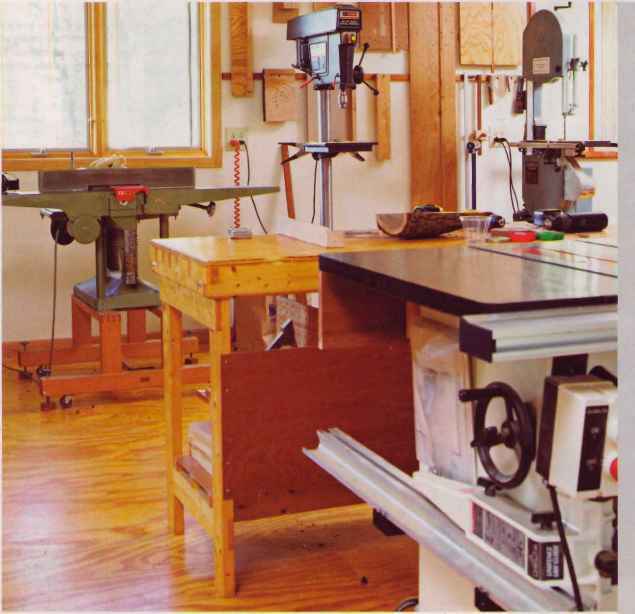 LEFT: Brian started with a standard European-style bench, but it was too small for his work, so he built a new one, adapting the design of Rhode Island School of Design master woodworker Tage Frid, who has described his benches as "a machine for clamping," Brian's hard-maple benchtop is considerably wider than Frid's design but features his classic multiple vises. ABOVE: A combination of movable and stationary shelves gives Brian the flexibility to change the layout of his shop as his needs evolve. His workbench is near two windows for plenty of natural light. cuits. "With all the circuits at 20 amps, I can plug in anything anywhere and not worry about blowing a breaker," he says. Brian also didn't skimp on the altitude—he's 6'2" tall, and "everything in the shop is scaled for me," he says. He has no trouble reaching the tools hanging on racks high on the walls. But the grabber is the polished floor. Over a W plywood surface glued on top of two layers of OSB, Brian applied four coats of McCloskey GymSeal, which is a tung-oil-based floor varnish. 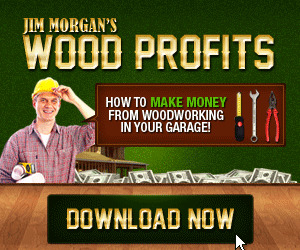 How to build mobil lumber storage? How to build a lumber storage rack? How to build lumber rack for floor images? How to build a sheet goods rack? How to build a portable lumber rack?